". . .one of the most tightly integrated orchestral pieces I've encountered in some time. At its core is a nine-note scale that gives rise to various permutations, yet beyond any manipulations of pitch sequences and relationships lies an inexorable, heroic quality I found remarkably compelling." A composer living in the Chicagoland area, Mike McFerron primarily composes concert music. His works range from orchestra to electroacoustic and have been performed throughout North America and Europe. On this website, visitors can learn more about McFerron by reading his biography and reading program notes of his music. Although all material is copyrighted, visitors may also download free MP3 audio files of his music for personal use. To purchase printed scores and performance parts, visit his publishing website, Red Earth Publishing. 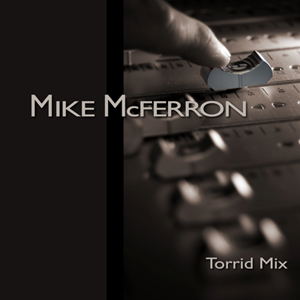 Michael McFerron's Torrid Mix for piano and electronic playback was a highlight of the program...The interplay between the electronic and piano parts was affective and appropriate. Mike McFerron's music is rich and full of driving energies and crisp, clean sounds. Grooves abound most of the time and when he takes a more delicate approach (such as Prelude or Dinadanvtli), he is equally effective. Great music here, you will enjoy this disc! ". . .This is a deeply moving, powerful testament to the courage and resilience of those who are harmed...be prepared to be moved to tears as you listen and watch: no mere electronic music or multimedia installation work, it is a galvanizing, effective example of art as political intervention to bring about a more just society."